Desert Tech DT MDR and MDR-C (Micro Dynamic Rifle) Modular, Multi-Caliber and Ambidextrous Semi-Auto Bullpup Combat/Tactical Rifle/Carbine Systems for Tactical Ops | DefenseReview.com (DR): An online tactical technology and military defense technology magazine with particular focus on the latest and greatest tactical firearms news (tactical gun news), tactical gear news and tactical shooting news. Desert Tech (DT), formerly Desert Tactical Arms (DTA), just released a couple of press releases on the brand new DT MDR (Micro Dynamic Rifle) and MDR-C (Micro Dynamic Rifle-Compact?) multi-caliber, modular semi-auto bullpup combat/tactical/assault/battle rifle/carbine systems with ambidextrous controls and forward eject. The ultra-cool rifles allow up to five (5) calibers, possibly (but not necessarily) including 5.56mm NATO (5.56x45mm NATO)/.223 Rem., 7.62mm NATO (7.62x51mm NATO)/.308 Win., .300 AAC Blackout (300BLK), and 6.8 SPC (6.8x43mm SPC), but this is just conjecture at this point, based on the rifles' respective light weights of 7.12 – 7.5 lbs. We don't know the calibers, yet, nor do we know whether or not select-fire/full-auto variants will be offered. If 7.62mm is one of the caliber options and a select-fire variant is offered, it will be interesting to see how controllable the gun is on full-auto, and what the cyclic rate of fire (ROF) is. If the MDR and MCR-C are indeed available in 5.56mm, it will be interesting to see how they perform during dynamic CQB/CQC (Close Quarters Battle/Close Quarters Combat) gunfighting versus standard-config assault carbines like the Colt M4/M4A1 Carbine and SIG MCX, and the various bullpup 5.56mm rifle/carbines like the Tavor TAR-21/SAR and ST Kinetics SAR-21 assault rifle, at least on semi-auto. Regardless, the new guns look pretty badass, and if they work as well as Desert Tech's previous products, they're going to be great. Due to their bullpup aspect, they'll fill a combat rifle niche and should prove very popular with civilian tactical shooters, law enforcement operators, and military Special Operations Forces (SOF) in need of the most compact and modular multi-caliber bullpup assault/battle rifle/carbine system possible. Military SOF may require select-fire/full-auto variants, though, depending on the mission profile. In any case, the DT MDR and MDR-C are two of the most interesting and exciting new tactical rifle/carbine products DefenseReview (DR) has seen in awhile, since they're unique and, in our opinion, have the potential ability to become real game-changers for military SOF and law enforcement tactical operations, and even civilian tactical shooting and hunting applications where toolless quick-change-caliber options in one rifle package are either desired or required. Of course, this is all predicated on them proving reliable, accurate and durable under high round count and adverse combat conditions, which our gut tells us they will. Regardless, they will most likely be a big draw at SHOT Show 2014, where they'll be formally introduced. DR is REALLY looking forward to getting our hands on these guns and running them at the range. 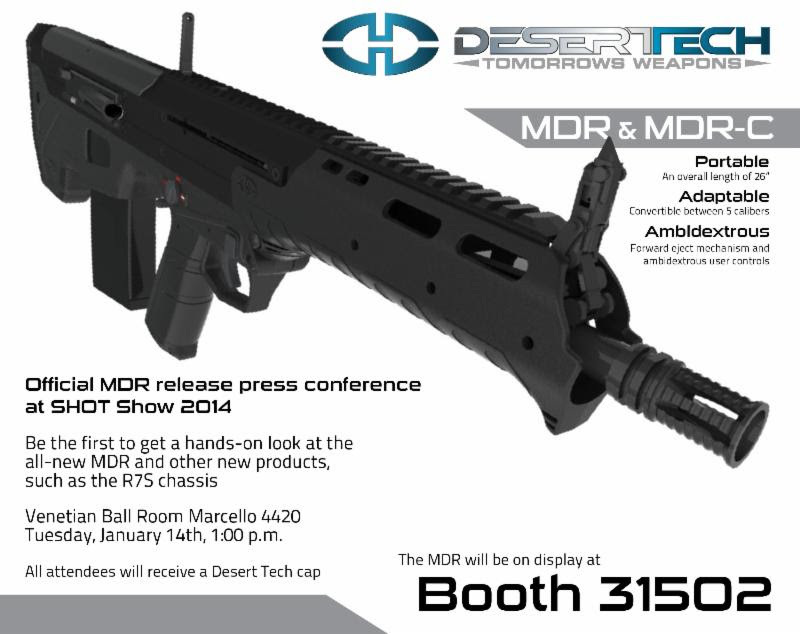 January 9th, 2014 -Salt Lake City Utah – Desert Tech is pleased to announce a new product for SHOT SHOW 2014 – the Micro Dynamic Rifle (MDR), it was announced today by Nick Young, CEO of Desert Tech. * Adaptable – The MDR is adaptable in both size and caliber. It can quickly convert between five calibers, and its patent pending sighting system retains barrel zeros without the need to compensate for any impact shift. * Ambidextrous – The MDR is fully ambidextrous with no modifications necessary. Our patent pending forward ejection mechanism and intuitive controls set a new bullpup stan dard for speed and precision. Desert Tech will be holding a press conference Tuesday Jan 14th at 1:00pm in the Marcello 4420 meeting room of the Venetian. This press conference will give media and industry friends an in-depth look into the MDR and all other products that will be released at the 2014 SHOT Show. Desert Tactical Arms was founded in 2007 and rebranded as Desert Tech in 2013. The company was created to provide the most compact, accurate and reliable precision weapon systems in the world. Desert Tech continues to provide the best firearms, ammunition and training possible for the military, law enforcement, and private gun owners. Desert Tech currently offers precision Bullpup rifle systems in calibers ranging from 260 Remington – 50 BMG. The Desert Tech Training Facility is the largest premiere training facility in the west, located on 25,000 acres in northeastern Utah. The Desert Tech Training Facility was created to provide a place for shooters and operators from around the world to obtain unparalleled firearms instruction with a curriculum designed to provide military, law enforcement, contractors, and armed citizen's real-life scenarios, which will produce a better a gunfighter. Desert Tech Ammunitions was created to optimize the performance of the Desert Tech Rifle System. The goal is to control and harmonize all of the components in the firing sequence. Desert Tech Ammunitions optimizes the firing system of Desert Tech rifles as well as numerous other commercially offered rifles to provide consistent match performance across the board." © Copyright 2014 DefenseReview.com (DR). All rights reserved. This material may not be published, broadcast, rewritten or redistributed without receiving permission and providing proper credit and appropriate links. 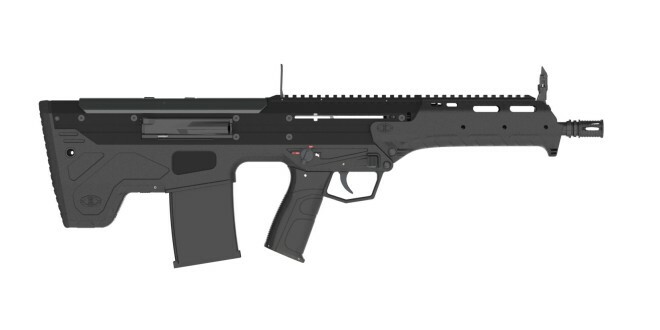 Desert Tactical Arms (DTA) Stealth Recon Scout (SRS) Covert Compact Bullpup 7.62x51mm NATO (7.62mm NATO)/.308 Win. Sniper Rifle for Military Special Operations (SPECOPS): First Test! Previous: Remington R-51 9mm Single-Stack Compact/Sub-Compact Pistol (7+1 Rounds) with Sliding Trigger for Concealed Carry (CCW) Cursory Analysis: The Pederson Action Makes another Run in the R51!